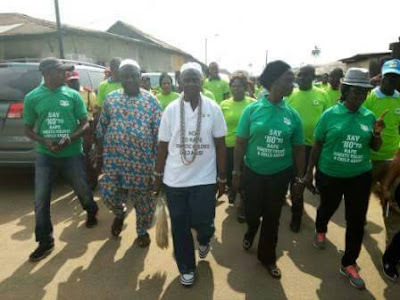 Lagos State Domestic and Sexual Violence Response Team (DSVRT), in collaboration with two Paramount Rulers, Oba Sefiu Olatunji Adewale, Olu of Epe and Oba Kamorudeen Ishola Animashaun, Olaoja of Epe, participated in an advocacy walk to end Sexual and Gender Based Violence in Epe. Speaking at the occasion, the traditional rulers commended the present administration for its efforts to eradicate sexual and gender-based violence in Lagos through the DSVRT. The Obas promised to give all the necessary support to ensure that not only Epe but also Lagos State is free from all sorts of domestic violence, adding that they will also educate the people in their domain to refrain from any acts of domestic violence. While maintaining that Epe, under their rulership would not condone child abuse or domestic violence, the Obas commended the State government for the introduction of community policing to affirm its policy of inclusiveness and determination to protect the lives and property of all residents in the State. In his remarks, the Chairman of Epe Local Government, Mr. Adesanya Adedoyin, who also participated in the advocacy walk, thanked the State Government for the awareness and promised to implement the agenda of the present administration on domestic abuse and gender violence at the local level. He confirmed his readiness support with the DSVRT to crush and destroy sexual and gender based violence in Epe and Lagos State in general. On behalf of the DSVRT, Dr. Keziah Awosika expressed the Agency’s appreciation to the traditional rulers for their efforts and fatherly role in eradicating the scourge of sexual and gender based violence in Lagos State.